Movistar Yamaha MotoGP’s Maverick Viñales was on the move today at the final stages of the sunny Gran Premio Movistar de Aragón. The Spaniard gradually increased his pace to take fourth place in the last part of the race. 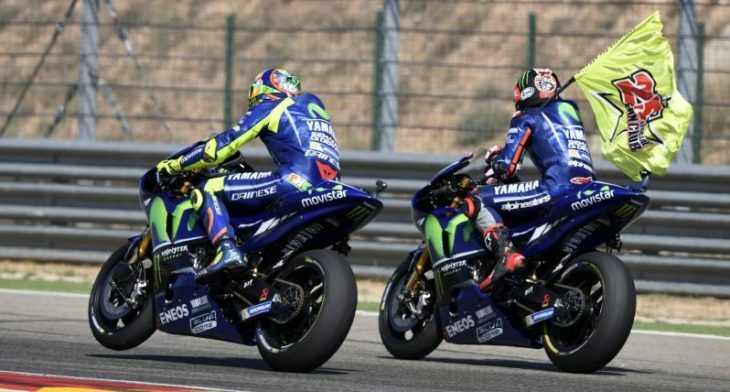 Teammate Valentino Rossi, opted for the opposite strategy. The Italian had a superb ride as he threatened to take the lead in the early race laps, just 24 days after sustaining a leg injury, before settling into fifth place, which he held over the line. Viñales had a less than perfect start on the short drive-up to the first corner, but he recovered quickly, slotting into second place. However, he had to let Rossi, Andrea Dovizioso and Marc Marquez pass him on the first couple of laps of the race as he was struggling to find grip. The third lap of the race was a turning point for the Spaniard; he got into a good rhythm and steadily started to catch up with the men in front of him. On the final six laps, when he began to press forward, he first took fifth place from Dovizioso and then proceeded to take on his teammate. The youngster was insistent, but Rossi wasn’t going to hand over fourth place easily. A close fight between the two Factory Yamahas had the fans on the edge of their seats. With three laps to go, Viñales successfully passed the nine-time World Champion, but the gap to the top-3 was too large for him to close in the final laps. He crossed the finish line in fourth place, 5.256s from first. Rossi had the crowds rooting for him during his first race since his enduro accident. Though he had a difficult launch from his starting position, he held on to his third place going into turn 1. Seeing Jorge Lorenzo trying to take off at the front on the first lap, the Doctor wasn’t about to waste any time and responded by passing his teammate a couple of corners later. He set a provisional fastest lap on lap 2 of 1’49.334s as he chased down his rival, and soon closed the gap. Despite riding with a leg injury, Rossi was pushing to the fullest. The top-4 riders bunched up as the Italian started to pressure Lorenzo, but he was unable to make a move whilst fending off Marquez and Dovizioso. With 11 laps to go, fatigue had the number 46 rider slow down a couple of tenths, allowing Marquez and Dani Pedrosa through, but he still had some fighting spirit left. He had the fans hold their breath as he battled hard with his teammate for fourth position, but ultimately took the chequered flag in fifth place, 5.882s from the front. Today’s results see Viñales remain in third place in the championship with 196 points, 28 from the top of the standings. Despite his brave ride, Rossi dropped one position to fifth in the rankings, with 168 points. In the Constructor Championship, Yamaha is in second place with a 17-point margin to first, while the Movistar Yamaha MotoGP Team must breach a 30-point margin to jump up from second to first in the Team Championship. The Yamaha Factory Racing Team will travel to Asia next, to take part in the Motul Grand Prix of Japan at the Twin Ring Motegi track in three weeks’ time, which will be the manufacturer’s home race. Johann Zarco’s strong effort at the gruelling Aragon Grand Prix earned him a 9th place finish today under the scorching Spanish sun. The French star leapt forward from 11th and he immediately set into a formidable and consistent pace. The rookie eventually concluded the race inside the top ten to maintain his position as the leading independent rider in the championship. The result also saw him extend his 100% point scoring record since the opening round. Meanwhile, Jonas Folger closed the challenging weekend with a hard-fought ride to 16th. The young German, who started his 150th Grand Prix today, began from the sixth row and pushed throughout the 23-lap sprint. He delivered a late charge to get to 16th, having moved up six places since the end of the first lap. WorldSBK: Match Point – Could we see Rea make history in France?